Virginia Rottweiler Rescue View other Rottweilers for adoption. 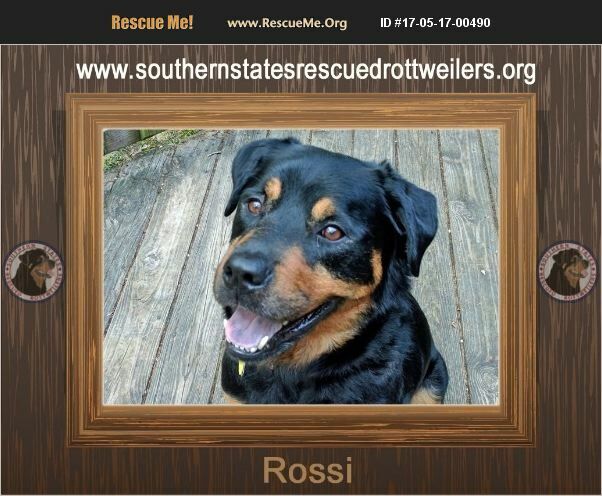 Rossi was dumped at a SC shelter with little explanation. He is a delightful male who is in the preparation phase of his heartworm treatment. He's a total love with people. Rossi will throw himself in to the arms of the veterinary staff and dissolves to mush for cuddling. He has been cautious when his foster mom's brother comes in the house, but warms up quickly. Rossi gets along well with the female rottweilers in the home, however he doesn't care for the smaller whippets, male or female. Therefore, we say that he is good with some dogs but NOT with all dogs. He doesn't know how to play well with the Rottie girls even though he does try! He's a bit pushy, loud, boisterous and rude for their taste, but they are working on teaching him. Someone, somewhere, spent time with Rossi. He beams when you praise him for sit, down and shake - things that he had already been taught. He loves balls and will roll and toss them all over the house. We have absolutely no doubt that he will thrive in a home with another larger female dog and parents that have the time to devote to making him the best he can be. Rossi WANTS to please and do things.